Someday they may bring you a fish and that would be great. Nothing like a fresh fish for the grill or skillet. I wish I would have spent more time fishing with my daughters but maybe the important thing is not the amount of time we spent fishing, but the fact that we did fish. Now, when they get the opportunity, it is not some foreign thing. There is fun to be had. My youngest daughter sent me this photo last summer when visiting her Uncle Bill. 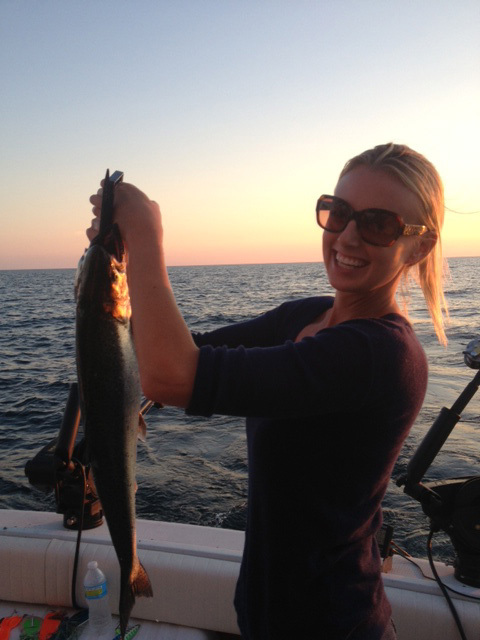 Her cousin Brent rented a charter on Lake Michigan and Lisa was game. Lisa teaches outdoor biology and is our family’s world traveler including trips to exotic lands to catalog wild amphibians and reptiles. Handling fish? No problem. I wish my oldest daughter had been there too – I would have loved another photo! As kids the two of them were competitive about catching bluegills out of Big Star lake and I expect Sara would have been in the hunt right along with Lisa. 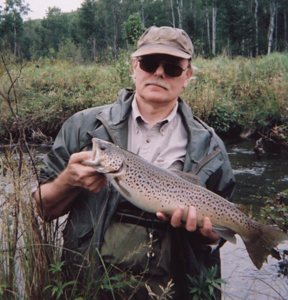 Feral has a daughter also whom he taught to fish – not just boat fishing but wading trout streams. 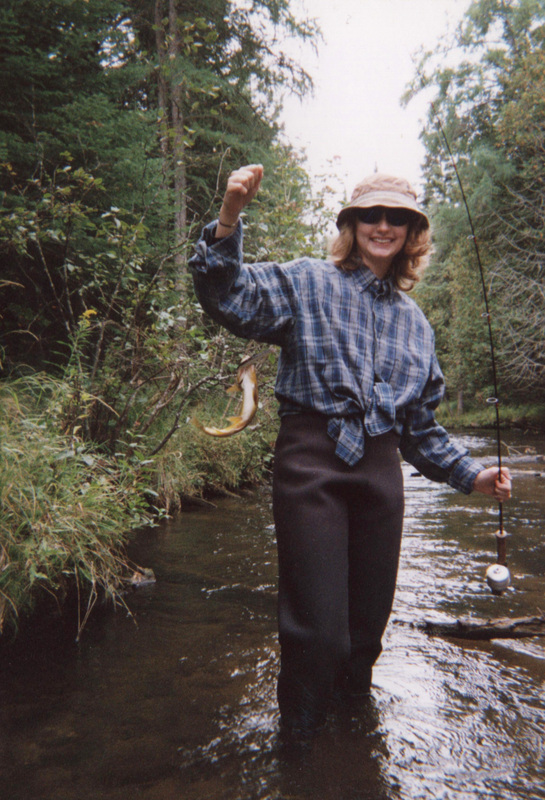 Patti has stopped by at trout camp a couple times and once asked to fish with me. We went to a mosquito infested spot on the upper sturgeon that can be described as difficult to wade and cast but that did not slow her down – she took a nice trout out of a hard to cast pool. Wow. So here is the message: If you are a young man with daughters please share your outdoor experiences. Don’t stereotype your young daughters as too feminine to enjoys the things you enjoy. Someday they may bring you a fish, and memories to last a lifetime. I recall my dad teaching us girls to fish,,,I didnt like the feel or smell of the bait (he had to put it on) and he also had to remove the fish,,,but thats not important,,the important thing was,,,spending time with MY DAD! Thank you Dad for teaching me how to fish 🙂 I love you! Lisa, no thanks needed – my pleasure! Love you!